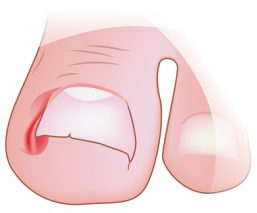 Onychocryptosis is otherwise known as an ingrown toenail. It occurs when part of the nail penetrates or increases pressure on the skin which causes pain, inflammation, hyper granulated tissue and commonly infections. How a Podiatrist can help? Persistent occurrences of ingrown nails – “ A Partial Nail Avulsion will be needed. Where the digit is under local anesthetic and only a part of the nail, the irritating side is removed from the nail root. No skin is cut, so no stitches are required. We can administer Phenol Acid to the nail bed to ensure re-growth does not occur if the problem lies at the nail bed. Patients can continue with their normal lives that same day but rest and foot elevation is advised. We ask that constrictive footwear or sporting activities are not carried out for at least 10 days while the toe is healing. Patient information – “ corrective self trimming, not wearing tight footwear or socks, check digits daily, keep feet clean, treat fungi infections. It is advised if patients have poor circulation or Diabetes that they get their nails trimmed by a Podiatrist to ensure corrective trimming and lessens the chances of cutting the skin, ingrown nails and infections. Thank you very much Michelle! I was so scared to have this problem fixed but you were very gentle and patient. I couldn’t wait to come back for my review to show how perfect my nails are! Very grateful for accommodating me on such short notice and fixing my horrible toe nail after the pedicure gone wrong moment. All the best to everybody at Dubai Podiatry Centre!